As an ode to my WordPress theme I am creating for this blog, I thought I’d create a WordPress inspired tutorial; How to create an icon in the style of their ‘W’ WordPress logo mark. This tutorial will be using vector shapes, so you can work to any size and the logo will be scalable. Use the eclipse tool and draw a circle on the centre of the canvas. Press and hold shift whilst dragging the mouse pointer to keep the eclipse to a perfect circle. Using the direct selection tool, click and drag the mouse pointer across the canvas to select the points of the circle. Next use the transform tools. Apple T / Ctrl T and drag the points inwards whilst holding Shift and Alt to keep the circle in proportion and decreasing from the central point. When you are happy with the new position press return to deselect. 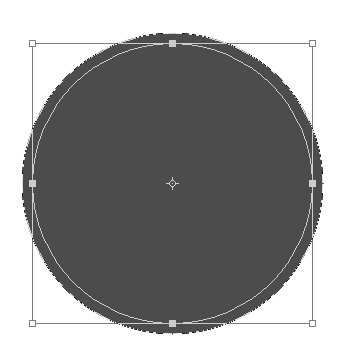 Click on the Vector Mask thumbnail in the layers palette to re-select the circle’s shape and select the inner points of the circle using the Direct Selection Tool. Hold Shift to select all four points together. With all four points selected, click on the pen tool, and click subtract from shape area from the shape options bar. Select the outer points again, and copy and paste again and transform the new points to create an inner circle. Use the direct selection tool to select only the inner circle and copy this Apple C / Ctrl C or Edit Copy and cut this from the canvas Apple X / Ctrl X or Edit Cut. Create a new shape layer by drawing a small rectangle with the rectangle tool on the side of the canvas. It doesn’t matter what size or shape you draw as this is purely to create a new shape layer. Select the new rectangle with the direct selection tool. Choose the Pen tool and choose add to shape area from the options. 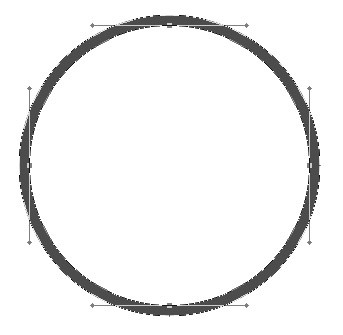 Paste the circle onto the new shape layer by using Apple V / Ctrl V or Edit Paste. You can now select the rectangle and delete it. Use the Horizontal text tool to draw a text box over the top of the circle and enter the letters you want to use. Choose a font and set the size of the letters. The letters should ideally fill the central area and overlap into the white area but not the outer circle. We can delete the bits that go over the outer circle at a later stage but you should be happy with how the letter interacts with the inner circle at this stage. I’ve chosen a B in Champignon Alt Swash. Champignon is free to download from Da Font. With the letter selected in the layers palette, right click the layer and choose convert to shape. The letter has now changed to a vector shape layer and you can edit it as such. Using the direct selection tool. Select all the points of the letter shape. Copy these points Apple V / Ctrl V or Edit > Copy and Cut the points by using Apple X /Ctrl X or Edit Cut. You will get a pop up box explaining that this will clear the vector mask. Click OK. Select the inner circle in the layers palette. Choose the Pen Tool and choose subtract from the shape area and then use Apple V / Ctrl V or Edit > Paste to paste the letter onto the circle layer. And to finally combine the outer circles with the letter shape you have to first select the smaller outer circle. Copy these points and cut them from the shape layer. At this point the shape will turn to a solid circle. 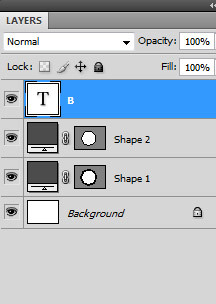 Hide that layer in the layer palette so you are able to see the layer on the canvas with the letter shape. Select the top layer with the letter shape and paste the circle. If the shape looks different from above choose ‘Exclude Overlapping Shape Areas’ whilst the shape is selected. Finally, turn back on the layer visbility for the remaining circle and follow steps 18 and 19 and paste it onto the letter shape layer. After you have pasted it you will have to choose ‘Exclude Overlapping Shape Areas’ this time. And you should have your final shape. The advantages of having all the shapes combined in this way on one shape layer means that they will always stay in proportion to each other. You can also use layer styles such as gradients and drop shadows and this will be applied to the whole shape rather than just a part of it.